At this moment I have children spread all over the world. My daughter is a missionary in Europe. My son, daughter-in-law, and grandkids are recent transplants to Hawaii. I have four children at home, and we’ll be adding four more through adoption in the next month. As a mom I want nothing more than to have all my children together. I want them in my house or at least down the street. I want to see their smiles. I want to feel their hugs. From the moment I held my small babies in my arms, I knew there would be a time when they’d leave home. But as I’ve had two grow up and leave, I’ve realized the whole meaning of motherhood isn’t to raise kids for adulthood (although that is important). The true meaning of motherhood is to raise our children for eternity. The time will come for all our children when we won’t be there for them. Instead, they’ll stand before God alone. They will go solo on that one. And God won’t ask what their GPA was, if they can play a musical instrument, or how well they cleaned their room and did their chores. God will ask one thing: “Did you know my son?” If our children know Jesus, they will have eternity with Him. The meaning of motherhood is to lead our children to know and understand the meaning of life. Life isn’t about what we get, what we have, or who we become. Life is about who God is and what He’s done—given His Son so we can have eternal life. So what does this mean for our parenting? How do we bring meaning to our role? How do we raise children to serve God with their lives? 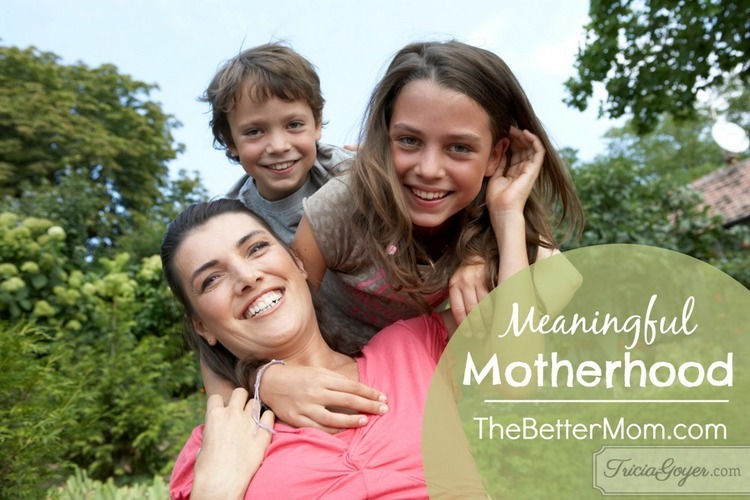 Head over to thebettermom.com to read the 7 ways to bring meaning to your parenting!